9/7 UPDATE: With an announced crowd of 8,533 at Monday's season finale, the DBAP welcomed a cumulative paid attendance of 554,788 in 2015, the number that will stand as the new all-time single-season record. 9/6 UPDATE: During the final Sunday game of the season, an announced crowd of 9,896 packs the DBAP bringing 2015 paid attendance total to 546,255 with one game still to play. With an announced crowd of 10,016 for Saturday's game, the Durham Bulls have again broken their all-time, single-season paid attendance record. Durham Bulls Athletic Park has now hosted a cumulative paid attendance of 536,359 during its 20th Anniversary season, surpassing the previous mark of 533,033 set a year ago. The final record-setting number will become set in the history books on Monday however, as the Bulls have two more home games still to play. A season removed from a massive renovation project and Triple-A All-Star festivities, the Bulls opened the year on April 15, looking to best a 2014 campaign previously regarded as the most successful in the storied franchise's history. On May 29, 30, and 31, the DBAP hosted three straight sellout crowds for the first time ever. The Bulls established a new single-game attendance high on July 4 (11,871), before selling out another three straight games weeks later on July 16, 17, and 18. 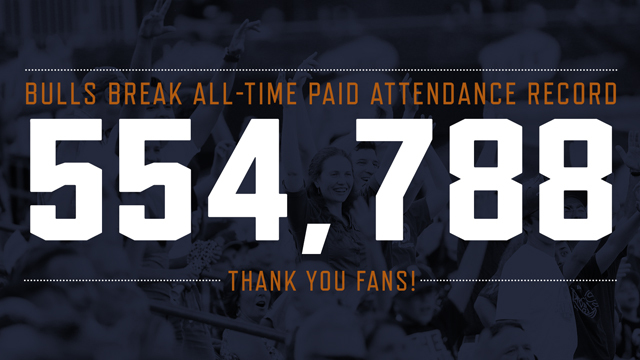 With fifteen capacity-plus crowds in 2015, the team has already set a new record single-season sellout total. The DBAP's current average per-game attendance of 7,773 is also a new single-season high. "This is the perfect ending to a historic 20th Anniversary season at Durham Bulls Athletic Park," said General Manager Mike Birling. "To break this record two years in a row speaks volumes about our amazing fans. They continue to show up in record numbers and they are what makes the DBAP a truly special part of the national baseball landscape."